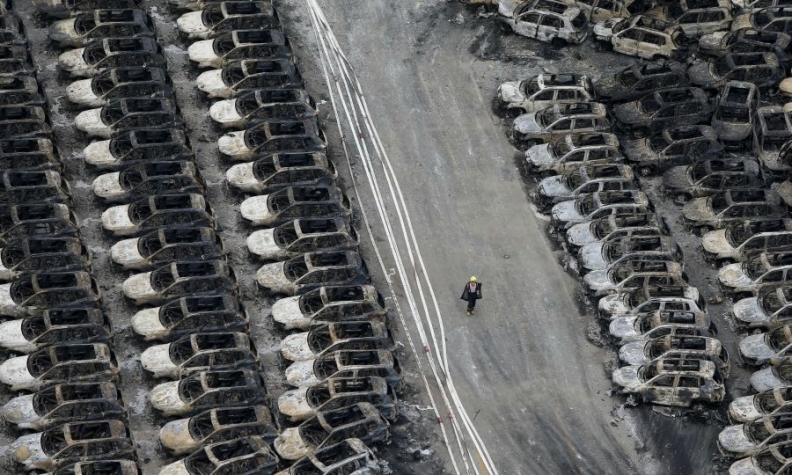 Thousands of vehicles being shipped by several automakers were destroyed in the blasts at Tianjin port in China. LONDON (Reuters) -- Jaguar Land Rover said its second-quarter results will be affected by a blast at the Chinese port of Tianjin in August that destroyed or damaged many of the 5,800 vehicles the company had at the site. More than 160 people died in a chemical explosion at the port which has also affected the supply of cars from a number of automakers. JLR, owned by India's Tata Motors, said today it was still assessing the damage and that it would take time to work out the level of insurance and other measures involved. "In these circumstances, there is likely to be a one-time exceptional charge in Q2 FY16 (July-Sept 2015) before any potential recoveries in subsequent quarters," the company said in a statement. Volumes had also been hit in the period due to a 32 percent slump in Chinese sales, where an economic slowdown has hit demand in the world's biggest car market. Overall sales fell 1 percent compared with the same three months last year, as double-digit rises in Europe and North American failed to outweigh the falls in China and the overseas region, which includes Russia, where sanctions imposed in the wake of the Ukraine crisis have hit demand. CEO Ralf Speth told reporters last month that despite the slowdown in China, which had been the firm's fastest growing market last year, he still expected overall sales to rise in 2015 compared with 2014. He said growth in areas such as Europe, where sales rose 34 percent and North America, which increased by 23 percent, could help offset the slump in China.